It is important to check and record a new ropes actual diameter when under normal load Conditions. During the life of the rope the inspector should periodically measure the actual diameter of the rope at the Same location under equivalent load-ing conditions. This procedure if followed carefully reveals a common rope characteristic — after an initial reduction, the overall diameter will Stabilize and slowly decrease in diameter during the course of the rope’s life. This condition is normal. 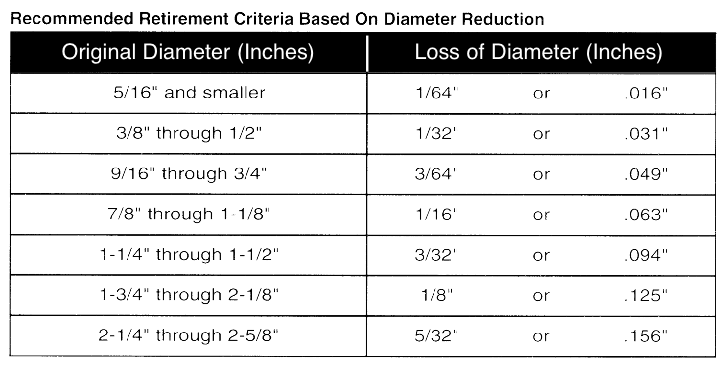 However, if diameter reduction is isolated to one area or happens quickly. the inspector must immediately determine (and correct, if necessary) the cause 01 the diameter loss. and Schedule the rope for replacement. Crushing or flattering of the strands Can be ceased by a number of different factors. These problems usually occur on multilayer spooling conditions but can occur by simply using the wrong wire rope construction. Most premature crushing and! or flattening conditions occur be-cause of improper installation of the wire rope. In many cases failure to obtain a very tight first layer (the foundation) will cause loose or gappy. conditions in the wire rope which will Cause rapid deterioration. Failure to properly break-in the new rope. or worse, to have no break-in procedure at all, will cause similar poor spool-ing conditions. Therefore. it is impeative that the inspector knows how tO inspect the wire rope as well as how that rope was installed. High stranding may occur for a number of reasons such as failure to properly seize the rope poor to installation or maintain seizing during wedge socket installation Some-times wavy rope occurs due to kinks or a very tight grooving proven Another possibility is simply introducing torque or twist into a new rope during poor installation procedures This condition requires the inspector to evaluate the continued use of the rope or increase the frequency of inspection.